Just before reaching Belgrade, where the last update was written, I was struck down with a particularly nasty stomach bug. We hoped it would pass in twenty-four hours like our previous bouts of illness, however it transpired to be somewhat worse than anticipated and I was bed-ridden for a full five days while Kate patiently sat by. Finally strong enough to hop back into Benji and continuing paddling, we had high hopes and a sound plan for the remainder of our expedition. However, it quickly became apparent that bad luck was still haunting us. Shortly after leaving Belgrade, the wind picked up so much that for almost two weeks we were unable to reach our target distance. Each day we were forced into piling out onto the river bank hours ahead of schedule, desperate to escape the headwinds thwarting us. It wasn’t only the strong gusts and headwinds that were making life hard for us; the wind whipped up large, breaking waves and white horses that were more akin to a stormy sea than river, conditions that required a noticeable increase in energy and concentration. It was times like this that made us feel grateful for being in such a stable sea kayak. Anything less substantial and we are certain we’d have ended up swimming in the Danube. However, there were glimmers of joy amidst all the frustration at the lack of progress. One morning while we were in Serbia, the wind was so ferocious that by 10am we were already scanning the riverbank for somewhere we could pull-up. Drifting along somewhat aimlessly, we were spotted by three fishermen who had made themselves at home under a wooden gazebo-like structure. Waving us over, they indicated that we should park Benji alongside their simple fishing boat. The men secured Benji so he didn’t drift away before graciously offering a hand as we clambered out. Once on land, we were ushered over to a small table under the shelter and cups of freshly made traditional coffee were placed in front of us. Though the men spoke no English, and we no Serbian, we managed to communicate fairly successfully through gestures and laughter. There was a slight chill in the air, and noticing that Kate and I were in shorts and t-shirts, two of the fishermen brought over their coat and jumper and gently wrapped them around our shoulders. Before long wafts of bacon were drifting over to us from the outdoors kitchen area a few metres away where breakfast was being prepared. One of the fishermen was laying the table with baskets of bread and plates laden with eggs, cheese, and chunks of tomato and onion. It looked undeniably delicious and Kate and I found ourselves looking on enviously, despite having eaten breakfast just a few hours earlier. Noticing our longing looks at the feast being prepared, one of the men chuckled to himself. Two extra chairs were pulled up and we were shepherded over to them, our protestations falling on deaf ears. Thus, we found ourselves sitting down for a late breakfast with our three new Serbian friends. Reluctant to drink the tap water that was offered to us, Kate and I instead found ourselves drinking beer. The meal was completed with a generous measure of rakija, a traditional home-brewed spirit typically with an alcohol strength of 50%. A second breakfast, spirits and beer all before 10:30am! The following day we entered the Iron Gates, an impressive gorge running between Serbia and Romania. The section of Danube immediately prior to the start of the gorge is a formidable 5km wide, before it narrows to just over 200m. Here, a medieval fortress perched high on the mountainside presides over any boats daring to pass through. 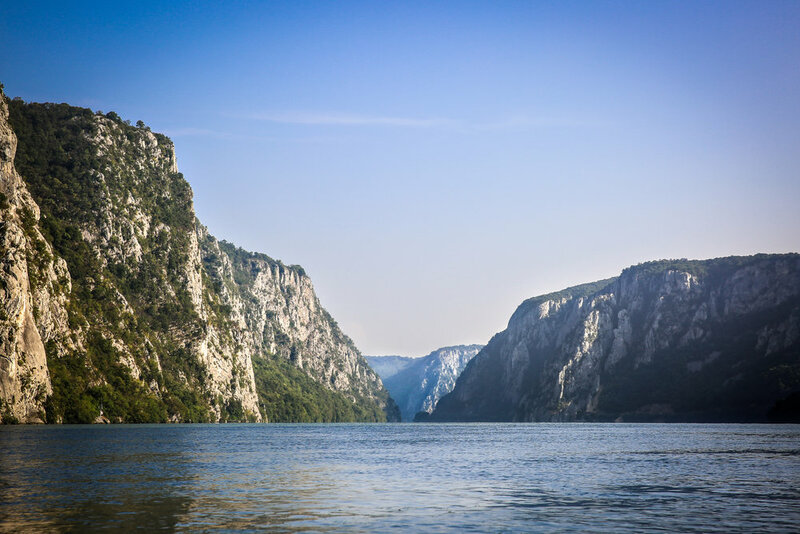 Further into the gorge, the river is a mere 150m wide and daunting 200m deep, making the Danube the third deepest river in the world. Paddling through the Iron Gates was breathtaking. High, imposing slabs of pale rock rose steeply out of the water, looming hundreds of metres above us, the early morning sun playing hide-and-seek behind their craggy summits. 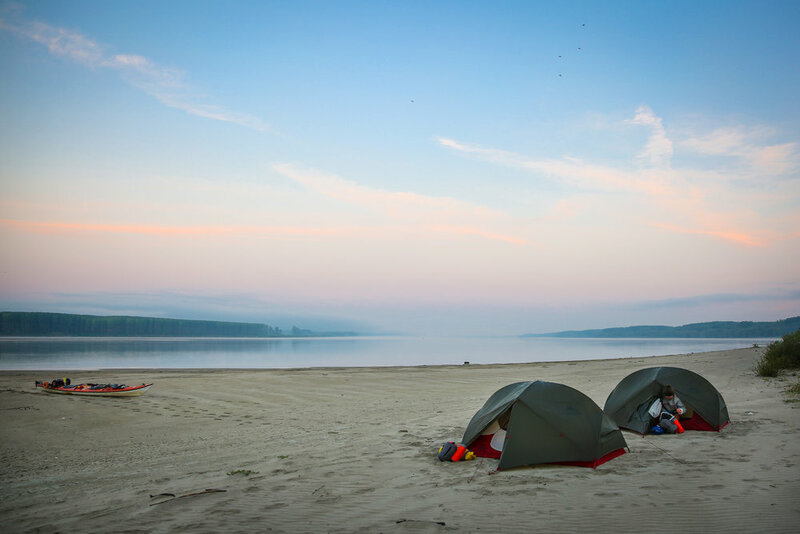 The landscape was more akin to the iconic Norwegian fjords than anything we had imagined could be found in Eastern Europe and made for an unforgettable few days of paddling. The Iron Gates also brought with it our final two locks of the entire expedition. The penultimate one went surprisingly smoothly considering we hadn’t been through a lock in some 900km. The very last one was a different story, however. The respective dam was on the Romanian-Serbian border, and as such there were two locks, one on either side of the river. We had been told to go to the Serbian side of the river and duly made our way there. Seeing that there were no other boats around and no phone to communicate with the lock-keeper, we resorted to paddling up to the border police station to ask if it was possible to go through the lock. 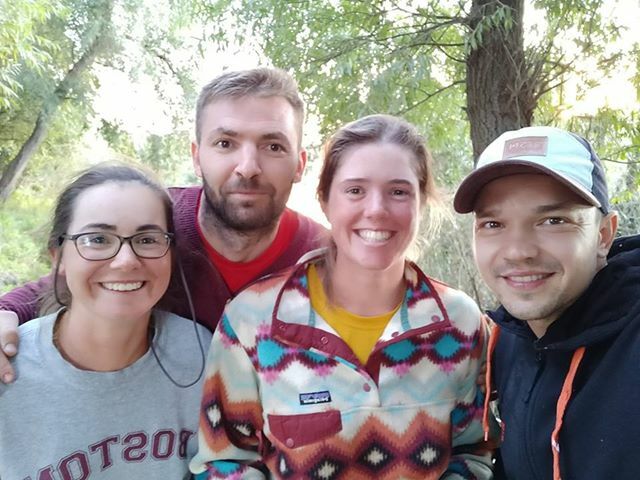 Once the two men had recovered from the shock of two girls in a kayak materialising, they broke the news to us that the Serbian lock was out of order and we would “just” have to paddle over to the Romanian side. Their use of the word “just” was slightly misjudged, for the Romanian lock was a half-kilometre paddle upstream into a brutal headwind. As such, it was exhausting work and we were incredibly relieved to eventually make it around the concrete spit signifying the approach to the lock entrance. Upon rounding the corner we promptly discovered that the ordeal was not yet over: an enormous barge was slowly exiting the lock, and another equally huge barge was waiting to go in. The consequence of this was that we would have to wait for both ships to complete their manoeuvres before we could paddle into the lock. Easier said than done as the only place we could wait was alongside the sloping concrete wall just in front of the lock which not only had no clear handholds, but also had waves washing up alongside it. We were forced to cling onto cracks in the concrete with our fingertips for forty-five minutes, our arms aching until we thought we could hold on no more. As the second barge finally made its way into the lock, we released our grip and started to paddle after it as we would normally. We had waved at the crew on the barge, trying to make it clear that we were following them in. Unfortunately, our gesticulations seemed to have got lost in translation. A few short metres from making it into the lock, we heard the unmistakable sound of the lock gate beginning to close, slowly rising from beneath the surface. It then dawned on us that nobody realised we were there; not the crew onboard the ship and, more importantly, not the men operating the lock. Knowing that continuing towards the lock would only end in disaster, I desperately started paddling backwards, fighting against the flow of the river and strong wind. Meanwhile, Kate was shouting and waving, trying to get the attention of the crew or lock-keepers. There was no time to turn around to try and paddle away, and we knew we would not be able to paddle backwards fast enough to escape the treacherous mechanism that was coming terrifying close to flipping us. Just as I was starting to calculate how to escape should we capsize, we saw a man running down the bank towards us, waving his arms and shouting. At first we were unsure whether he was instructing us to get out of the way, but as he neared we realised he was beckoning us in. Without a moment’s hesitation we began paddling forwards as fast as we could, the adrenaline pumping through our bodies. Once inside we made our way straight over to a mooring post, the waves and wind an added complication. Our hearts were still racing as the lock-keeper reached us, apologies tumbling from his mouth; as suspected, he had not seen us and realising there was a helpless kayak bobbing around was almost as stressful for him as it had been for us! The following day we checked out of Serbia, crossed the river and checked into Romania, the final country we would officially set foot in on our expedition. Landing by the police station was not straightforward: there was sinking sand and an abundance of plants coiling their way around our paddles. Through some determination we were able to manoeuvre Benji alongside one of the police boats, tied him to it and climbed on-board. We then had to shimmy up the sloping wall and hop over a fence at the top. Straightening up, we were confronted with three armed policemen, their faces an expression of confusion and amusement… Suffice it to say, we know how to make an entrance! Thankfully all proceeded smoothly and we were checked into Romania with no complications. With Kate starting university at the end of September, we were faced with the disappointing reality that we were not going to be able to reach the Black Sea under our own steam. The wind-induced delays had set us back by a significant enough amount of time that no matter how many hours we paddled for each day, we would not reach our goal before we needed to be back in Oxford. We thought long and hard about our options before recruiting my dad, once again. 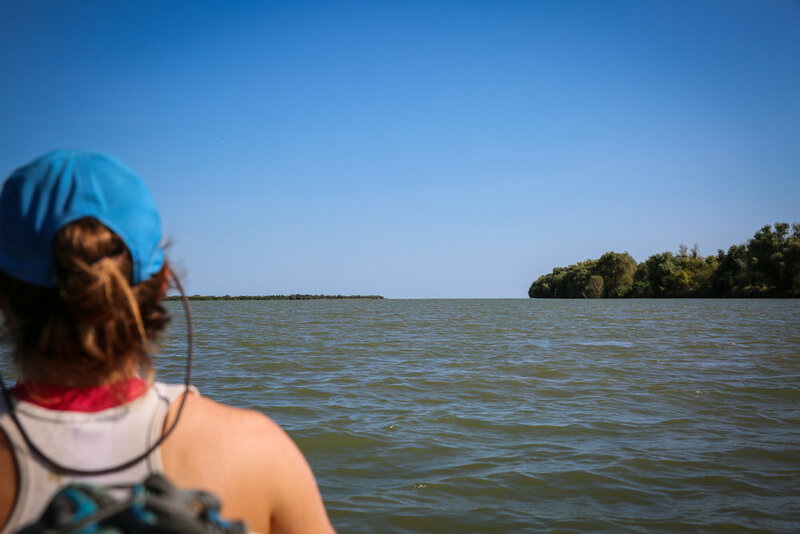 We decided that the best option would be for us to paddle as far as we could in the remaining time, before meeting my dad who would drive us - and Benji - to the Danube Delta, where we would complete the final two days of kayaking to the Black Sea. Eventually the wind eased up and for a few days we were able to cover good distances. Each evening we found stunning beach islands to camp on where we were able to watch both the sunset and sunrise the following morning. We began to feel like our progress had never been hindered and were lulled into forgetting that we were on the verge of completing our expedition. Sadly, the inescapable time came to lash Benji to the top of my dad’s car to drive to the Danube Delta. 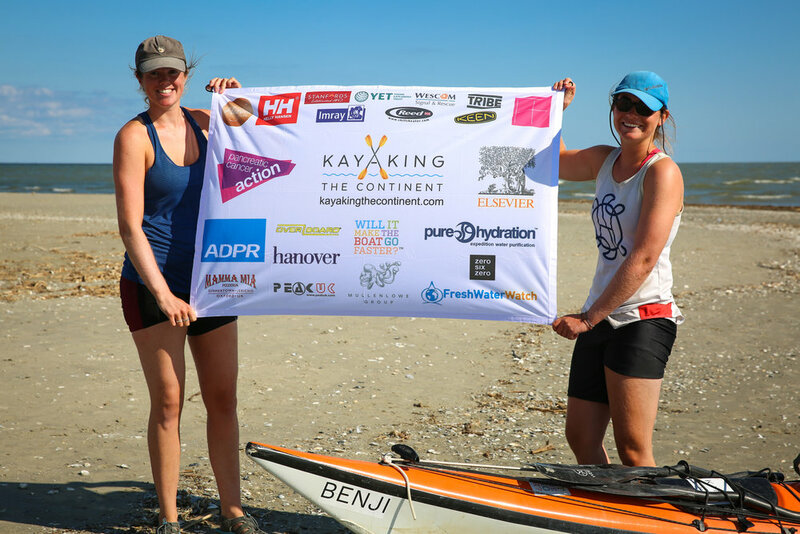 During the two last days on the river, Kate and I were quite quiet and subdued; despite all the challenges we had to overcome on this expedition, as we neared the Black Sea we realised we were not ready to finish. 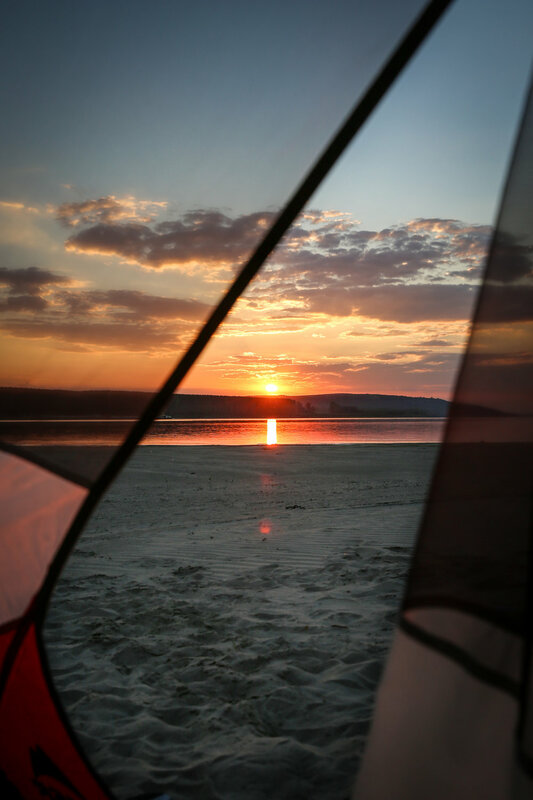 We had grown so accustomed to our life of camping, paddling, sunrises and sunsets that the prospect of leaving it behind was somehow disheartening. The Danube’s parting gift to us came in the form of two Romanian fishermen who brought us each a chilled cider and stayed to chat for a while. After the number of generous and kind people we have met through this adventure, we couldn’t have thought of a better way to spend our final evening. On the last day, we allowed ourselves a slow start, gratuitously dragging out the trivial details of our morning routine that we had grown so attached to. As we repacked Benji and paddled away from our campsite, it almost felt like we had just another normal day ahead of us. 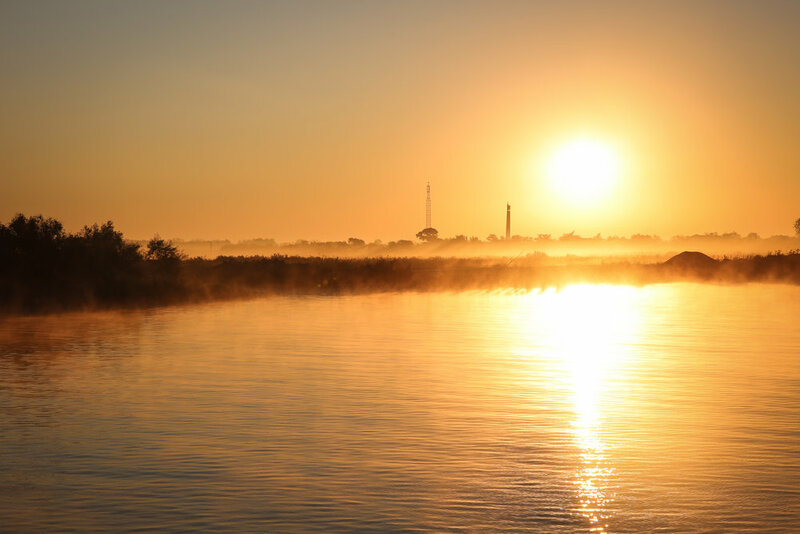 Yet after a few hours, a bend in the river revealed an open horizon… Just a few kilometres ahead of us was the Black Sea. Members of our families joined us for the remaining kilometres, bobbing around quietly on a motorboat just behind us. As we passed the headland and made it into the the gently rolling waves, a whoop erupted behind us. 150 days after starting our expedition at Westminster Bridge, we had made it to the Black Sea. Kayaking the Continent was complete. Though our physical journey is over, this is not the end of us sharing the experience. We will continue fundraising for Pancreatic Cancer Action (you can donate here) and there will be a few more blogs to come on aspects that we feel deserve more attention, including it feels to return home after such an incredible experience!